The Senate Committee on Financial Crimes and Anti-Corruption, on Wednesday, quizzed the Acting Chairman of the Economic and Financial Crimes Commission, Ibrahim Magu, over the arrest of the Chairman/Managing Director of Innoson Vehicle Manufacturing, Chief Innocent Chukwuma. Magu, who appeared before the committee to defend the EFCC’s proposed budget for 2018, was questioned behind closed doors for about 30 minutes. Stepping out of the venue, the EFCC boss confirmed to journalists that Chukwuma was arrested by the anti-graft agency. He, however, declined to make further comments, promising that the commission would release a statement on the matter soon. The EFCC later released Chukwuma on bail but accused him and his brother, Charles, of alleged involvement in a N1.4bn fraud. Earlier on Wednesday, members of the Senate took turns to criticise the EFCC for the manner in which the industrialist was picked up on Tuesday in Enugu. The lawmakers accused EFCC of highhandedness and adopting military approach in the execution of its duties. They therefore mandated the Senate Committee on Financial Crimes and Anti-Corruption to investigate the matter and report back to the chamber on Thursday. The Senate, however, rejected an additional prayer by Senator Monsurat Sunmonu, which was seconded by Senator Oluremi Tinubu, that the Committee on Women Affairs should investigate the alleged assault on Chwukuma’s wife by the EFCC operatives. The lawmakers added the task to the terms of reference of the probe panel. 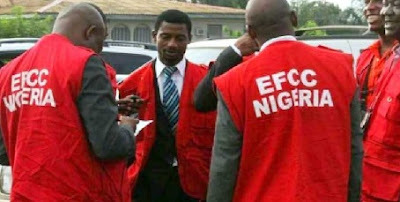 Operatives of the EFCC had stormed Chukwuma’s home at Savage Crescent in the GRA area of Enugu on Tuesday, during which some of the senators alleged that his wife was assaulted before the businessman was arrested forcefully. The EFCC operatives, who were said to be accompanied by heavily armed policemen, stormed the building around 7.30am. At the plenary on Wednesday, the Deputy Senate President, Ike Ekweremadu, raised a point of order to criticise the EFCC for the arrest, which according to him, is a private matter between a bank and its customer. “If we reduce our security agencies to agencies of debt recovery, then we are doomed as a nation,” he stated. Narrating details of his conversation with the Innoson boss, the Deputy Senate President said, “Yesterday, I got a number of messages indicating that Mr. Innocent Chukwuma was arrested by the EFCC over a transaction between him and GTB. “This morning, I made an effort and I spoke with him. His story is straight forward: he said he was at his house at 5am on Tuesday when he heard gun shots and he thought they were assassins and he went into hiding. “After about two hours, he saw some people and policemen, and he thought that help had come. So, he came out of his hiding and ran to a policeman who promptly arrested him. He tried to find out what his offence was and they told him that when they get to the police station, they would inform him of the offence. As of today, nobody has told him what the offence is. “Any person, who is arrested and detained, should be informed of the reason for the arrest. As I speak, Mr. Innoson Chukwuma has yet to be informed of what led to his arrest or detention, but if you go through the media today, the story is that he is owing GTB. Ekweremadu described Chukwuma as one of the greatest industrialists in Nigeria and who has employed over 5,000 people.